Our residential care services in Newcastle provide a warm, safe and friendly environment for older people to reside in. Our 24-hour personal and practical support is provided by well-trained, caring staff. The support is designed to ensure that our residents continue to enjoy maximum independence as well as peace of mind, knowing that help is always at hand. We endeavour to meet each individual resident’s personal circumstances and lifestyle preferences whilst maintaining and enhancing their quality of life. Privacy and choice are high on our priority list. We understand and respect that the majority of older people value keeping their independence. Our carers work with residents to ensure that their care encompasses every aspect of well-being and their care needs are continually met. Being interested in what is going on and taking part in fun activities is a vital part of life. Our approach to residential care focuses on ensuring that we offer a stimulating range of activities. Theswe are designed to reflect the wishes and interests of our residents and help them maintain close bonds with their local community. 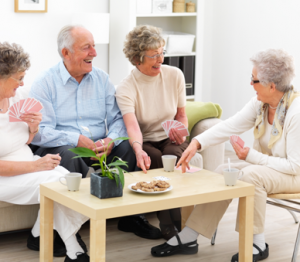 Our care home has a dedicated Activities Co-ordinator who arranges a variety of opportunities for our residents to enjoy daily activities in the home as well as in the local area of Newcastle. We encourage activities that enhance our residents’ lifestyle, hobbies, health and well-being. These can range from day trips to leisure facilities and places of interest, to arts, crafts, games and social events in the home. We work together with a number of health and social care professionals who either visit our homes on a regular basis or who will make visits by arrangement. These include the local GP, district nurse, dentist, optician, physiotherapist, chiropodist and holistic therapists. Mealtimes are a social and enjoyable time of the day and central to our residential care. All our menus offer freshly cooked, appetising and nutritionally balanced meals with a different seasonal choice every day. Our dedicated care teams undergo intensive training and are required to complete QCF (Quality care framework) qualifications. Our carers are passionate about what they do and we specially select staff for their personal qualities, such as being instinctively warm with a natural desire to help others. Residents and their relatives can have peace of mind that our residential care is delivered by well qualified, welcoming and caring professional staff. Our aim is to provide an environment where our residents feel at home with the benefit of having all their individual care needs supported. 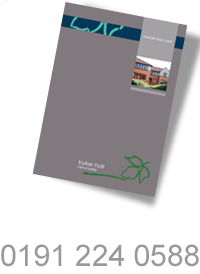 If a resident or their family feels their level of care may change in the future, Byker Hall offers residential care as well as nursing care and specialist care for dementia. This gives peace of mind for residents concerned that their needs might change in the future and do not want to be uprooted from their familiar surroundings and friends to change to a different care home.